There is evidence that the silts, sands, and gravels that overlie the Paleozoic and Mesozoic bedrocks and that underlie the loess, dune sand, and alluvium may represent more than one age. This evidence is discussed under "Age and correlation". In this report the undifierentiated Pleistocene sediments are included with the Ogallala formation because the Pleistocene sediments cannot be distinguished from the Ogallala (Pliocene) and because the Pleistocene may be absent in some parts of the county. Character--The Ogallala formation consists of calcareous silt, sand, gravel, and clay. In most places it is capped by caliche, but locally the caprock may be limestone or chert or both. Examination of the cuttings from 11 test holes that penetrated the Ogallala showed that the formation is composed principally of silt. The percentage of silt ranges from about 35 to 85 and averages about 55. About 35 percent of the Ogallala is sand and about 10 percent is gravel. As a rule, the coarser material is found toward the base of the formation and the fine sand and silt are near the top. Clay and caliche occur in lesser amounts in parts of the formation especially near the top. The silt is made up almost entirely of quartz grains, which are angular to subangular and are pale gray, pink, and red. The sand is predominantly very fine grained, but. may range from very fine to coarse, and it consists of rounded grains of quartz and some magnetite. The gravel is fine to coarse and is made up of quartz and feldspar and other material derived from igneous rocks. Much of the Ogallala formation is logged as clay by many of the drillers, but examination of the cuttings from more than a dozen wells in Morton County revealed that the material being called clay was mostly silt and very fine sand. Small amounts of clay may be intermixed with the silt, but beds consisting wholly of clay were found only in one well (144). The material comprising the Ogallala formation is poorly sorted Individual beds generally are discontinuous and within very short distances may grade vertically or laterally into material of different composition. Logs of the wells (138-144) of the Kansas City Power and Light Company at Elkhart, which are only a few hundred feet apart, show marked changes in the character of the Ogallala from well to well. Similarly, certain beds along the outcrop of the Ogallala can be traced for only short distances. In most parts of the county where the Ogallala is exposed it is capped by a thin limestone underlain by a thick bed of caliche. The limestone is a buff to light-brown compact rock that generally contains disseminated well-rounded grains of quartz and magnetite in unusual feature of the cap rock of the Ogallala in this area is the presence of bands of white and gray chert that are 0.5 to 6 inches thick and are 1 to 3 inches apart. They are especially prominent near Point Rock. The Ogallala material is loosely cemented except for the cap rock. The cementing material is principally calcium carbonate and occurs throughout the formation, but it is most abundant near the top. Distribution and thickness--Almost the entire county is underlain by the Ogallala and associated Pleistocene deposits, but a thin mantle of dune sand covers these deposits in most of the area south of Cimarron River, and a mantle of loess covers them in much of the upland north of the river. In small areas along the Cimarron and its tributaries the Ogallala is covered by alluvium or has been eroded away, exposing the Cockrum sandstone or the Triassic (?) redbeds. The thickness of the Ogallala ranges from a few feet to nearly 600 feet. In the northwestern quarter of the county it is 80 feet thick in places, but locally it is absent. It thickens toward the east and south. In the southwestern part of the county it is 300 feet thick and in the northeastern part it is 275 feet thick. The maximum thickness is found in the southeastern corner of the county, where gas test wells have penetrated as much as 595 feet of the Ogallala before reaching the redbeds. Many drillers' logs lead to erroneous estimates of the thickness of the Ogallala because the Ogallala and Cockrum generally are grouped into one unit that may be called simply sand and gravel. Test hole 1 in sec. 4, T. 31 S., R. 39 W., (fig. 2) encountered only 261 feet of the Ogallala formation overlying the Cockrum sandstone, but the log of a gas test well only a few miles to the southeast indicated 520 feet of sands and gravels referred to the Ogallala overlying the redbeds. The original smooth plain . . . was alluvial--i.e., stream built. It was spread, in substantially its present position as to elevation and inclination, by widely shifting, heavily loaded, and deposition streams from the mountains. Shifting deposition, burial, and plain building constitute the normal habit of desert streams. Virtually the same mountain streams are at present cutting away and degrading where formerly they made broad fan-form deposits and built up. They are running in fixed courses and have excavated valleys. Age and correlations--The silts, sands, and gravels in Morton County that were formerly assigned to the Ogallala formation (Pliocene) are probably in part Pleistocene in age. Recent studies by Smith (1941) and others have shown that much of the so-called Ogallala formation in southwestern Kansas is late Pliocene or Pleistocene in age. A gravel pit in the NE1/4 sec. 21, T. 34 S., R. 42 W., (pl. 8) contains many well-rounded fragment as large as 10 inches in diameter composed of Cockrum sandstone, of caliche, and of lava and other igneous rocks. These gravels are probably post-Ogallala in age. Beds of volcanic ash in post-Ogallala beds in southern Hamilton county seem to be correlative with similar beds of volcanic ash in Meade county that contain undoubted Pleistocene fossils. Plate 8--Quarry in gravels near Cimarron River (photo by H.T.U. Smith). Although a part of the post-Cretaceous silts, sands, and gravels in Morton County seem to be post-Ogallala in age, the greater part of the material probably was laid down in middle Pliocene time. 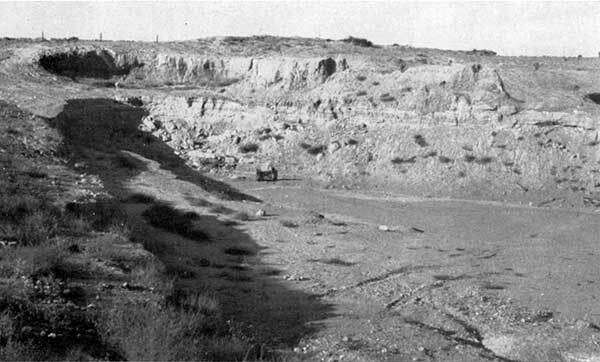 Schoff (1939, p. 61) reports that more than 10,000 middle Pliocene horse teeth have been taken from excavations in these beds at a point near Optima, Okla., which is only about 20 miles south of the Morton-Texas county line. Water supply--In Morton County as in most of the southern High Plains region the Ogallala formation is the most important water-bearing formation. The saturated part of the undifferentiated Pliocene and Pleistocene sediments is probably entirely within the Ogallala formation in Morton County. About 70 percent of the domestic and stock wells, all the municipal wells, and most of the irrigation wells obtain their water from this formation. The yield of these wells ranges from 1 gallon a minute from wells pumped by windmills to about 1.000 gallons a minute from some of the wells used in supplying water for the drilling of gas test wells (123, etc.). The largest yields from the Ogallala are obtained from the coarse sands and gravels that are most abundant in the lower part of the formation. The Ogallala formation serves as a huge underground reservoir. The reservoir may at one time have been nearly full, but down-cutting streams such as Cimarron River have cut below the zone of saturation and are draining part of the water from the reservoir. Drillers speak of the water in the Ogallala as occurring in "sheets" separated by zones that yield little or no water. Some drillers have reported as many as 8 or 10 such "sheets" within the formation. It is probable that these are not separate zones of saturated material, but simply one saturated zone containing alternating beds of fine and coarse material. The fine material, although saturated, probably docs not yield enough water for domestic or stock use so the drillers regard it as dry. The coarse material yields water freely and is logged as "water sand." A well for irrigation (63) was reported to have penetrated "water sands" at depths of 125 to 204 feet, and 280 feet, and 376 feet, and to have had a static water level 88 feet below the land surface. Thus the Ogallala in this well is saturated from a depth of 88 feet to 376 feet. The altitude of the water level in well 148, in the southwestern part of the county, is 3,521 feet, but in neighboring wells it is only 3,450 to 3,475 feet. Well 148 may penetrate a small saturated zone held above the normal water table by relatively impermeable material. The municipal well at Rolla (92) encountered water at a depth of 280 feet and it rose to a point 200 feet below the land surface. The water in this well probably was held below a bed of relatively impermeable material. Most of the wells in the Ogallala obtain water from sand; only a few" deep wells get water from beds of gravel and coarse sand. The water from the Ogallala is hard, but it is suitable for most ordinary uses. Its fluoride content is small except in that from wells north of the river, where the fluoride content may exceed 2 parts per million because of recharge of the Ogallala by water from the Cockrum sandstone. Locally the water in the lower part of the Ogallala is slightly softer than water from the upper part. General features--A thin deposit of loess overlies the Ogallala formation and undifferentiated Pleistocene deposits in about two-thirds of the area north of Cimarron River and in a small area east of Elkhart along the Kansas-Oklahoma line. It occurs principally on the uplands and has been eroded away along stream valleys and in some interstream areas (pl. 1). The loess is buff to brown and, near the surface, black. In general about 65 to 75 percent of the loess is made up of silt, and the rest is clay and fine sand. The soils formed from the loess are dark compact heavy silt loams, clay loams, and silty clay loams underlain by a lighter-colored calcareous clay subsoil. The maximum thickness of the loess is not known, but cut-tings from test holes drilled in this area indicate that in most places the loess is 4 to 6 feet thick. A dug well in the northeastern part of the county, however, is reported to have penetrated 15 feet of loess. Water supply--No water is obtained from the loess, because it is relatively impermeable and lies above the zone of saturation. As it is relatively impermeable, it retards the downward movement of rain water and thus hinders the recharge of the ground-water reservoir. Character--The Ogallala formation is overlain by thin deposits of dune sand in about three-fourths of the area south of Cimarron River and in several isolated areas north of the river (pl. 1). The small areas of dunes that are being built in the northern part of the county are composed of reworked sand derived from adjacent out-crops of the Ogallala formation. The sand is made up of quartz grains, clusters of fine quartz, and fragments of caliche. The dune sand south of the river and just north of the river in the eastern part of the county consists of uniform medium-grained well-rounded quartz grains. In the southern part of the county, where a good soil zone has developed, the dune sand contains a small amount of clay and organic material. Two distinct types of topography are recognized in the sand dunes south of Cimarron River. The first type lies just south of the river and is characterized by typical sand-dune topography. The grass-covered dunes are moderately steep irregular hills between which are valleys and undrained basins. The second type lies south of the first type and is marked by broad subdued swells and swales. It has a thicker soil cover and is extensively cultivated. Distribution and thickness--The dune sand covers most of the southern half of Morton County and extends into Stevens County, Kansas, Baca County, Colorado, and Cimarron County, Oklahoma. The thickness of the dune sand ranges from a few inches to a maximum of about 75 feet. Origin--The dune sand was probably derived from the sands of the alluvium of the Cimarron River valley and perhaps in part from adjacent outcrops of the Ogallala formation. 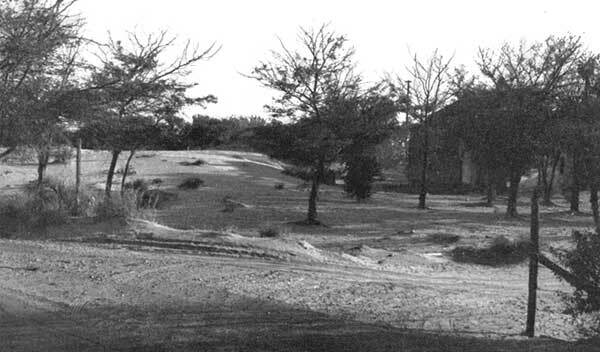 The dunes may have been formed originally south of the river by a prevailing north wind. Later prevailing winds from the south probably caused the dunes to encroach upon the Cimarron River valley. In his discussion of the origin of sand dunes in western Kansas, Smith (1941) describes an ideal dune cycle consisting of two phases: First, an eolian or active phase during which the dune is built up, and second, an eluvial or passive phase during which vegetation prevents further growth and the dune is subdued by weathering and creep. He divides the eluvial phase into stages of youth, maturity, and old age. In the youth stage the soil zone is formed and slopes are somewhat reduced. The dune becomes mature when its profile is smooth and regular and when its soil becomes thicker and more stable. Old age is reached when the dune form is undistinguishable. He states that the eluvial phase in any stage may be interrupted by rejuvenation. Both the eluvial and eolian phases are represented in the Morton County sand dunes, but most of the dunes are in the eluvial phase at the present time. The dunes just south of the river represent the youth stage, for they are covered by grass and are being lowered by erosion and creep. The area farther south is covered by dune sand in the mature or old stage. The dune profile is smooth and regular or is entirely erased, and a thick soil has developed and is now being cultivated. The dunes in this area have lost so many of their former characteristics that they were not recognized as sand dunes until recently. Over-cultivation in recent years, however, has removed much of the protective cover of vegetation and the dune in many places have been rejuvenated and are again in the active eolian phase (pl. 9). Similarly recent strong wind action has rejuvenated some of the dunes near Cimarron River that were in the youth stage (pl. 5A). In places the soil zone in the old dunes is sufficiently thick to permit safe cultivation, but in others it is too thin and cultivation has proved unprofitable. Plate 9--Dune sand encroaching upon an orchard in Morton County (photo by H.T.U. Smith). Age--The dune sand was originally deposited before or contemporaneously with the loess. The fact that the Ogallala formation rather than loess crops out in the "windows" between the sand dunes indicates that the sand was not laid down on a preexisting deposit of loess. Such a "window" in the dune area is found northeast of Rolla (pl. 1). Furthermore, along the southern margin of the sand dunes the sand is in. contact with the Ogallala formation rather than with loess, except in one small area where recent winds have blown the sand southward into the loess mantle. The age relation of the dunes sand and the alluvium of Cimarron River is difficult to determine, for both deposits represent continuous deposition over long periods of time. The alluvium is still being laid down and the sand is being rejuvenated and reworked. It is possible that some of the sand dunes now cover a part of a once broader Cimarron River valley. The absence of bluffs along the south side of the river, the lesser depths to the water table just south of the river, and the different chemical content of the water from wells south of the river may indicate that Cimarron River has been forced to flow along the north side of the valley by the encroachment of dunes from the south. A few miles west of Morton County in southeastern Colorado the Cimarron valley is more than 5 miles wide and the stream is more nearly in the middle of the valley, whereas in Morton County the valley is only 0.5 to 1 mile wide. Water supply--The dune sand lies above the water table, so it does not supply water to wells, but the porous sand dunes provide excellent recharge facilities for the underlying ground-water reservoir. The rain that falls on the sand dunes probably recharges the Ogallala in southern Morton County and in areas to the south and east. General features--Cimarron River and its tributaries have deposited alluvium in their valleys. It is made up mainly of sand, but contains smaller amounts of gravel and silt, and some clay. The sands consist mostly of subrounded quartz grains, although some of the coarse-grained sands and gravels contain grains of quartz and mica and other material derived from igneous rocks. Only a few wells penetrate the alluvium, and data on its thickness are meager. Well 70, in sec. 23, T. 33 S., R. 41 W., is 20 feet deep and does not reach the underlying bedrock; well 69, in sec. 23, T. 33 S., R. 43 W., penetrates 20 to 50 feet of alluvium, but obtains its water supply from the underlying bedrock. If well 105 ends in alluvium it is possible that the thickness of the alluvium of the Cimarron River valley may in places exceed 75 feet. Only one well (20) penetrated the alluvium of North Fork of the Cimarron and it was reported to have struck the Cockrum sandstone after having passed through 30 feet of alluvium. The material in the alluvium of the Cimarron was probably derived from sands and gravels of the Ogallala formation along the headwaters of the river in northeastern New Mexico, western Oklahoma, and southeastern Colorado. Water supply--The alluvium is very permeable and yields moderate quantities of water to stock wells in the Cimarron valley. Sufficient water would probably be available to wells for irrigation in the Cimarron valley, but the stream channel has widened until little if any irrigable land is left. The water from the alluvium is very hard. Water from well 70 had a hardness of 1,437 parts per million and contained 632 parts per million of sulphate.